Tips on how to search the library's holdings for books, eBooks, digital records, images, periodicals, and more. Summit is the shared library catalog of the Orbis Cascade Alliance, a consortium of 37 colleges and universities in Washington and Oregon. This service provides access to over 28 million books, DVDs, videotapes, sound recordings, government documents and significantly expands access to resources for faculty and student research. To borrow materials through Summit and retrieve them, you will need to sign-on to Primo using your SU username and password. Direct borrowing of returnable materials is available to students and faculty at member institutions and materials are delivered to campus from member libraries within 5-7 business days. The loan period for general circulating material is 6 weeks. DVDs and other "short-loan" material can be borrowed for 6 days. No renewals are allowed in Summit. Although there is no direct cost to borrow materials, each borrower must honor the due dates for materials or he/she will be assessed a fine of $0.50/item/day for the first 10 days, then $1.00/item/day for subsequent days. In the event that a borrower allows total fines to reach $10, he/she will be blocked from further use of the Summit system until the account has been resolved. For more information on Summit, contact the circulation desk at at 206.398.4220 or lawreference@seattleu.edu. 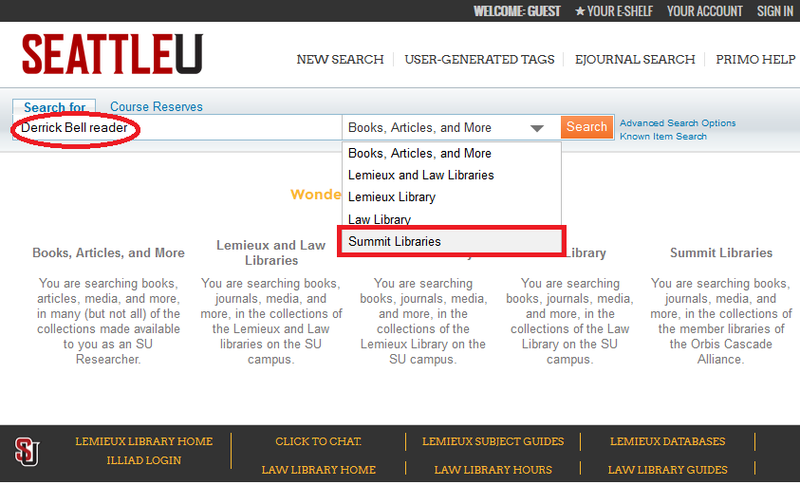 From the library catalog, enter your search terms and select Summit Libraries. Click on Request a copy under the title you wish to borrow. Sign-in with your SU username and password to see your request options. Click on Place Summit request (about 5 days). 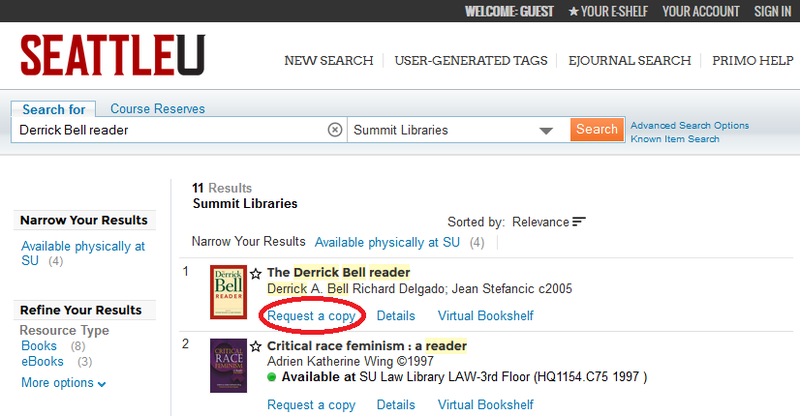 Select Pickup/delivery location (Law Library) and click Request. If you need help with your research, please send us a question via our e-mail reference service at lawreference@seattleu.edu or visit us or call the reference desk at 206.398.4225.